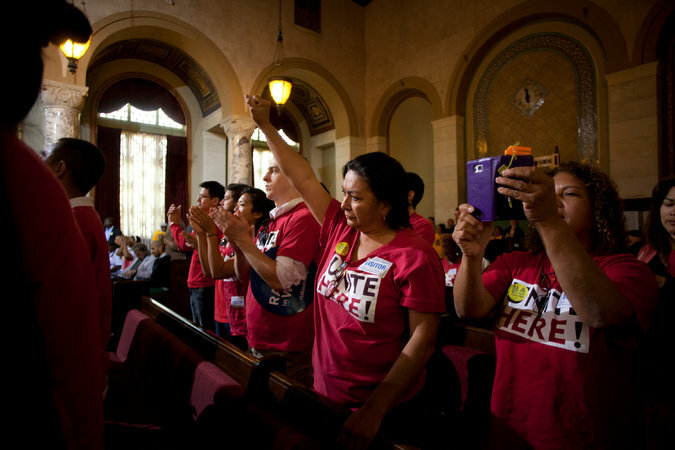 Members of Unite Here Local 11 voice their support for a $15 municipal minimum wage at Los Angeles City Council chambers on Tuesday. 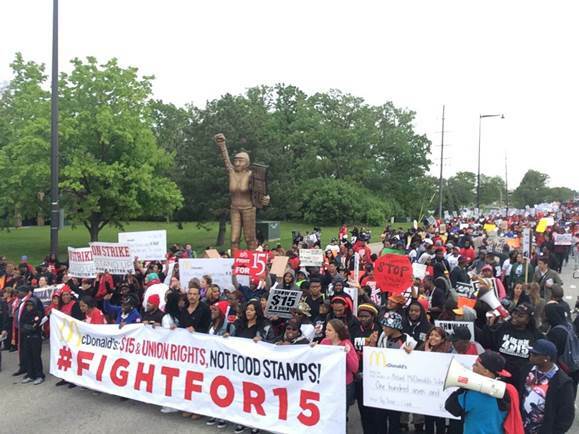 Thousands of McDonald's employees protest Wednesday outside the corporation's headquarters in Oak Brook, Illinois. On Tuesday, the Los Angeles City Council voted 14-1 to adopt a citywide minimum wage of $15/hour by 2020. The next day, marching behind a giant banner that read, "McDonald's: $15 and Union Rights, Not Food Stamps," 5,000 cooks and cashiers show up at the company's corporate headquarters in Oak Brook, Illinois, to kick off the largest-ever protest to hit the burger giant's annual shareholder meeting. These events represent the two battlegrounds in the growing war over wages taking place across the country. One strategy focuses on getting elected officials in local and state governments to adopt minimum wages above the federal level. The other strategy involves putting pressure on major employees -- typically highly visible companies that depend on positive public relations to gain consumers' dollars -- to raise the wages of their employees. The two strategies complement rather than compete with each other, creating an increasingly powerful movement that involves both low-wage workers and their middle class allies. Even some business leaders understand that raising wages among the working poor is good for the economy because it increases consumer demand for goods and services. Activists in an increasing number of cities -- including Seattle, Chicago, Oakland, San Francisco and now Los Angeles -- have pushed their local governments to pass municipal minimum wage laws. Today, 22 cities and counties set their minimum wages above the federal threshold of $7.25 an hour. Twenty-nine states also set their minimum wages above the federal level. Fifteen states index their minimum wages to rise automatically with the cost of living. In just the past two years, thirteen states and the District of Columbia have enacted minimum wage increases. Even voters in so-called conservative "red" states have expressed their frustration with stagnating wages. Last November, in Arkansas, Alaska, South Dakota and Nebraska, voters by very wide margins approved ballot initiatives to raise their state minimum wages. Washington State's $9.47 minimum wage is currently the highest among the 50 states, but it will soon be overtaken by California, whose statewide minimum wage will jump to $10 next year. The Economic Policy Institute recently released an issue brief regarding the projected impacts of the increased minimum wages in 20 U.S. states. The size of the increases ranged from Florida's $0.12/hour to a $1.25 increase in South Dakota. According to the Economic Policy Institute (EPI), the increases would provide workers with $1.6 billion in additional wages in 2015. The study estimated that roughly 2.5 million workers would be directly impacted by the increases in 2015. That figure would be even higher if the EPI estimate included the minimum wage hikes in Seattle, San Francisco, and other cities. In Los Angeles, almost half of the city's private and public work force earns less than $15 an hour. Under the plan approved Tuesday, the minimum wage will rise from $9 to $15 over five years, a 66 percent boost. After 2020, the minimum wage would increase each year based on the inflation rate. Simultaneously, low-wage workers for fast-food chains, big box retailers, janitors, security guards and others have forged a grassroots movement to pressure their employers to raise starting salaries and benefits. Over the past three years, workers at fast-food chains such as McDonald's, Taco Bell and Burger King have gone on strike and demanded a base wage of at least $15 per hour. Walmart workers have engaged in one-day work stoppages and protests as part of an escalating grassroots campaign to demand that the nation's largest private employer pay its workers at least $25,000 a year. Walmart workers and their community allies have organized highly visible protests at hundreds of Walmart stores on Black Friday -- the day after Thanksgiving -- the biggest shopping day of the year. Some workers and allies have engaged in civil disobedience and been arrested, similar to the tactics of the union movement of the 1930s, the civil rights movement of the 1960s, and the environmental and community organizing movements of the past quarter century. These protests have won some important victories. In February, for example, Walmart -- the nation's largest private employer with 1.3 million workers -- announced that it would pay even its lowest-level workers at least $9 an hour starting this spring and raise that to $10 next year. The company also said that it would boost the pay of department managers' pay to at least $13 this year and $15 next, thus offering its low-wage "associates" a clearer path to advancement. Walmart estimated that about 500,000 employees will receive a raise, totaling roughly $1 billion a year. Just one week after the Walmart announcement, TJX Cos, the owner of T.J. Maxx, Marshalls and Home Goods stores, said it would also pay employees to at least $9/hour in June, 2015. By, 2016, the company said that workers who had at least six months' seniority would receive at least $10 hour. This is nearly identical to the Walmart plan. A recent Credit Suisse analyst report estimated TJX's average hourly pay at $8.24/hour. TJX has 191,000 employees worldwide, including an estimated 150,800 in the United States. The company's new wage policy would increase employees' incomes by an estimated $75 million in the first year alone. In March, the Wall Street Journal reported that Target planned to increase wages to at least $9/hour. A Target spokesperson said the company's goal was to "always be competitive with the marketplace." Target has 347,000 employees in the United States. The company had previously stated that it paid all employees more than the federal minimum wage of $7.25/hour, but the company did not disclose how many employees were earning less than $9/hour. A March 2015 report from investment firm Stifel, estimated that Target's announced changes would total an increase of $250 million a year in workers' wages. The radical ideas of one generation often become the common sense ideas of the next generation. In the case of the minimum wage, the shift in public opinion has occurred much more quickly. The workers' protest is gaining public sympathy. Polling by Hart Research Associates has found that in just two years, strikes and other protests by low-wage workers have significantly changed public opinion. A national poll conducted by Hart in January discovered that 63 percent of Americans support raising the federal minimum wage to $15. Growing activism by low-wage workers around the country -- assisted primarily by SEIU, UNITE HERE and the United Food and Commercial Workers union -- has put a public face and sense of urgency over the plight of America's working poor. The proportion of American workers in unions has fallen to 11 percent -- and to 6 percent in the private sector. Union activists view these campaigns among low-wage employees -- disproportionately women, people of color and immigrants -- as a potential catalyst to rebuild the labor movement as a force for economic justice and as a way to regain public support. Two years ago, President Barack Obama called for an increase in the federal minimum wage to $9. Last year, he upped the ante to $10.10. Earlier this year, the Democrats in Congress announced their support for a $12 federal threshold. The momentum is so great that even some Republicans are jumping on board. When he ran for president in 2012, Mitt Romney opposed an increase in the federal minimum wage, but a year ago, in an interview on MSNBC's "Morning Joe," Romney urged Republicans to endorse a $10.10 minimum wage, arguing that it would help GOP candidates "convince the people who are in the working population, particularly the Hispanic community, that our party will help them get better jobs and better wages." Given the current gridlock in Washington -- where Congress hasn't boosted the federal minimum wage, stuck at $7.25 an hour, since 2009 -- no one expects the Republican-controlled House and Senate to raise the wage floor. In April, 41 Senators -- all Republican -- voted to block a bill to raise the federal minimum wage to $10.10 per hour over three years. But the dramatic changes in public opinion, growing grassroots activism and the escalating number of local and state minimum wages guarantee that this will be an issue in next year's races for President and Congress. Democrats and Republicans alike will be forced to answer the question, "Which side are you on?" in the growing debate over widening economic inequality, persistent poverty and stagnating wages. An increase in the federal minimum wage to $12 would pump billions of dollars into the U.S. economy, according to a report by EPI and the National Employment Law Project (NELP). Workers who are both directly and indirectly affected would see nearly $80 billion in increased earnings over the next five years. Because low-wage workers tend to spend increased earnings locally on basic needs, this will benefit Main Street businesses that rely on consumer spending. When employers don't pay their workers a living wage, taxpayers are forced to pick up the tab in the form of government assistance. A NELP study revealed that the low wages paid to employees of the 10 largest fast-food chains cost taxpayers an estimated $3.8 billion a year by forcing employees to rely on public assistance to afford food, health care and other basic necessities. American taxpayers pay $153 billion in public assistance to working families each year, according to a recent study conducted by the University of California's Berkeley Center for Labor Research and Education. This is more than the annual budgets of the U.S. Department of Education and Health and Human Services combined. Some states are considering telling the poor-paying companies to pick up the tab instead. Advocates call this the "Walmart tax." "It's time for us to stop subsidizing these corporations. It's time they redesign their business models to pay their employees a wage they can live on," wrote Connecticut state representative Peter Tercyak, a Democrat who sponsored legislation to charge large companies a fee of $1 per hour, per worker, for all workers who make less than $15 an hour. Only companies with more than 500 employees would pay, with the money raised going into state programs for early childhood development and social services. On Wednesday, in the midst of the protests at McDonald's' corporate headquarters, four U.S. public pension fund officials warned that McDonald's and other companies may be jeopardizing their own futures by returning excessive amounts of cash to investors via share buybacks. The four officials -- New York City Comptroller Scott Stringer, New York State Comptroller Thomas DiNapoli, Chicago Treasurer Kurt Summers and California Controller Betty Yee -- are fiduciaries to pension funds with $860 billion in assets. This upsurge in the wage wars hasn't come about all of a sudden. It is the result of years of both changing conditions, effective grassroots organizing, and changing public views about the poor. Throughout his presidency (1981-1988), Ronald Reagan often told the story of a so-called "welfare queen" in Chicago who drove a Cadillac and had ripped off $150,000 from the government using 80 aliases, 30 addresses, a dozen Social Security cards and four fictional dead husbands. Journalists searched for this welfare cheat and discovered that she didn't exist. Nevertheless, Reagan kept using the anecdote to demonize the poor. Reagan's bully pulpit, and the increasing success of right-wing think tanks and writers in dominating public discussion about poverty, led to a protracted political debate about welfare. To show that he was a different kind of Democrat, Bill Clinton campaigned in 1992 to "end welfare as we know it," in part by "making work pay." Congress enacted so-called welfare reform in 1996, limiting the time people can receive assistance. Although liberals understandably decried this approach, it ironically helped shift public opinion and stereotypes about the poor. According to historians and sociologists, the public distinguishes between the "undeserving" and the "deserving" poor. The latter are viewed as more responsible, hard-working, and victims of circumstances beyond their control. Increasingly, Americans came to view low-income people as the "working poor," a group considered more sympathetic than the so-called "welfare poor." In the 1990s, the mainstream news media began to pay more attention to the working poor, while academics and journalists expressed growing concern about the "Walmart-ization" of the economy -- the growing number of low-wage jobs with few benefits. Barbara Ehrenreich 2001 book, Nickel and Dimed: On (Not) Getting By in America, recounted her experiences toiling alongside hard-working low-wage employees who couldn't make ends meet. It soon became a national bestseller. In the 1990s and early 2000s, community and union organizers successfully pushed local governments in more than 100 cities to adopt "living wage" laws, narrowly targeted to employees of firms that had contracts and subsidies from local governments. In 2004, San Francisco and Santa Fe, New Mexico were the first two localities to adopt citywide minimum wage laws, now $10.74 and $10.66, respectively. Then, in November 2013, 66 percent of the voters in Albuquerque, New Mexico, voted in favor of establishing a citywide wage that would automatically adjust in future years to keep up with the rising cost of living; it is currently $8.60 an hour. That same day, 59 percent of voters in San Jose, California approved a citywide $10 an hour wage that would also increase with the cost of living. The San Jose victory created a regional momentum. In May of last year, the City Council of Sunnyvale -- a San Jose suburb of over 140,000 residents -- voted by a 6-1 margin to establish a local minimum wage of at least $10/hour, and to increase it annually with the cost of living. That same month, in a remarkable display of regional cooperation, Washington, D.C. and its suburban neighbors, Montgomery and Prince Georges County, Maryland, all adopted laws establishing a minimum wage of $11.50. The joint effort was forged to counter business warnings about an exodus of jobs if the nation's capital moved on its own. In 2012, Long Beach, California voters passed a ballot measure that raised the minimum wage for hotel workers in that tourist city to $13 per hour and guarantees hotel workers five paid sick days per year. In November 2013, voters in the suburb of SeaTac approved a union-sponsored Good Jobs Initiative' to raise the minimum wage to $15 an hour for workers in Seattle-Tacoma International Airport and at airport-related businesses, including hotels, car-rental agencies and parking lots. The new law applied to only 6,000 workers, but the victory had huge ripple effects. Seattle Mayor Mike McGinn and his chief challenger Ed Murray both supported the SeaTac initiative and raised the possibility of doing the same thing in Washington's largest city. On the same day that the SeaTac measure won, so did Murray and Kshame Sawant, a socialist candidate for Seattle City Council who had made the $15/hour minimum wage a centerpiece of her campaign. After his victory, Murray followed through. He appointed a 24-person Income Inequality Committee -- co chaired by Howard Wright, CEO of Seattle Hospitality Group, and David Rolf, president of SEIU Local 775, who had been a major force behind the minimum wage proposal. Rolf was adept at playing the inside/outside game. While pushing to forge an agreement among the task force members, he worked with Seattle's labor movement and community activists to keep the pressure on city officials and to keep the issue in the media. He made sure that economists and other experts were available to educate the public, politicians and journalists and to rebut the business leaders' warnings that the $15 minimum wage would kill local jobs. Both Rolf and Mayor Murray discovered that socialist Sawant was a useful, though unpredictable, ally. She was working with a group called 15 Now that threatened to put an initiative on the November 2014 ballot to raise the minimum wage to $15 an hour on January 1, 2015 for all businesses. Murray told business leaders that unless they reached an agreement with the unions, he would announce his own plan that was closer to Sawant's proposal than the phased-in plan that was being discussed in the mayoral task force. Seattle's progressives clearly had the political momentum. Even after a series of compromises, the unions and their allies won a huge victory. They agreed to a three- to seven-year phase-in, with large businesses -- those with at least 500 workers -- required to reach the $15 wage first. The combination of worker protests against stingy corporate employers and battles to get politicians to enact local and state minimum wage laws is part of a broader movement to address America's widening inequality. A recent study by the Institute for Policy Studies found that the bonuses handed to 165,200 executives by Wall Street banks in 2013 -- totaling $26.7 billion -- would be enough to more than double the pay for all 1,085,000 Americans who work full-time at the current federal minimum wage of $7.25 per hour. The Occupy Wall Street movement, which began in New York City in September 2011 and quickly spread to cities and towns around the country, change the national conversation. At kitchen tables, in coffee shops, in offices and factories, and in newsrooms, Americans began talking about economic inequality, corporate greed, and how America's super rich have damaged our economy and our democracy. Occupy Wall Street provided Americans with a language -- the "one percent" and the "99 percent" -- to explain the nation's widening economic divide, the super-rich's undue political influence, and the damage triggered by Wall Street's reckless behavior that crashed the economy and caused enormous suffering and hardship. A national survey by the Pew Research Center conducted in January 2014 found that 60 percent of Americans -- including 75 percent of Democrats, 60 percent of independents, and even 42 percent of Republicans -- think that the economic system unfairly favors the wealthy. The poll discovered that 69 percent of Americans believe that the government should do "a lot" or "some" to reduce the gap between the rich and everyone else. Nearly all Democrats (93 percent) and large majorities of independents (83 percent) and Republicans (64 percent) said they favor government action to reduce poverty. Over half (54 percent) of Americans support raising taxes on the wealthy and corporations in order to expand programs for the poor, compared with one third (35 percent) who believe that lowering taxes on the wealthy to encourage investment and economic growth would be the more effective approach. Even after the Occupy protestors moved out of parks and public spaces, the movement's excitement and energy were soon harnessed and co-opted by labor unions, community organizers, and progressive politicians like mayors Ed Murray of Seattle, Bill de Blasio of New York, Betsy Hodges of Minneapolis, Eric Garcetti of Los Angeles, and many others, who have embraced the idea of using local government to address income inequality and low wages. Major business lobby groups routinely oppose raising the minimum wage at local, state and federal levels. But a recent survey of business executives suggests that these trade associations may not be speaking for the majority of their members. In fact, a majority of business executives surveyed by CareerBuilder.com actually favor raising the minimum wage, saying it would raise the standard of living among their employees and give the companies a better chance to hold on to their workers. A whopping 62 percent of employers said the minimum wage in their state should be increased. A mere 8 percent of those surveyed said that the current minimum wage of $7.25 an hour is fair. The majority of employers, 58 percent, said a fair minimum wage is between $8 and $10 an hour, while others nearly 20 percent said a fair minimum wage is between $11 and $14. And another 7 percent believed that minimum wage workers should make $15 or more per hour. (The study was based on a survey of 2,188 full-time hiring and human resource managers). In other words, progressives have clearly won the moral argument. Americans believe that people who work should not live in poverty. So business groups have to resort to persuading the public that raising the federal minimum wage -- or adopting a living wage or minimum wage plan at the local level -- will hurt the economy. Business lobby groups and business-funded think tanks - including the U.S. Chamber of Commerce and its local affiliates, the National Restaurant Association, the American Legislative Exchange Council, the Employment Policies Institute (an advocacy group funded by the restaurant industry) and other industry trade associations -- typically dust off studies by consultants-for-hire warning that firms employing low wage workers will be forced to close, hurting the very people the measure was designed to help. But such dire predictions have never materialized. That's because they're bogus. In fact, many economic studies show that raising the minimum wage is good for business and the overall economy. Why? Because when low-wage workers have more money to spend, they spend it, almost entirely in the local community, on basic necessities like housing, food, clothing and transportation. When consumer demand grows, businesses thrive, earn more profits and create more jobs. Economists call this the "multiplier effect." Moreover, most minimum-wage jobs are in "sticky" (immobile) industries -- such as restaurants, hotels, hospitals and nursing homes and retail stores -- that can't flee. Business arguments against raising the minimum wage -- particularly that it is a "job killer" -- are crumbling. An analysis by Fortune magazine concluded that Wal-Mart can afford to give its employees a 50 percent raise without hurting the company's profits or stock price. The analysis explained that "[b]etter-paid employees are likely to work harder and stick around longer. If employees made more, they would have more to spend at Wal-Mart." A recent University of Massachusetts study concluded that fast-food giants like McDonald's could raise wages to $15 without shedding jobs, which flies in the face of the National Restaurant Association claims that,"$15 would clearly jeopardize opportunities for existing and prospective employees." In a paper published in the Harvard Business Review, William Lazonick, a University of Massachusetts economist, and two colleagues documented that McDonald's has spent over $30 billion on share buybacks in the last decade. McDonald's, the world's largest fast-food chain, has 36,200 retail outlets in 119 countries, 6,700 of which are owned by the corporation; the rest are run as franchises. In the U.S., the company owns 1,500 of the 12,500 McDonald's restaurants with a total of 840,000 employees. Lazonick and his co-authors argue that McDonald's should have spent that money raising worker pay, or invested it in the company, instead of using it to "manipulate" its stock price and enrich executives and short-term investors. Peter Dreier teaches Politics and chairs the Urban & Environmental Policy Department at Occidental College. His most recent books include The 100 Greatest Americans of the 20th Century: A Social Justice Hall of Fame and Place Matters: Metropolitics for the 21st Century (coauthored with John Mollenkopf and Todd Swanstrom).